People sometimes gaze upon a point and think that it could be the whole of the matter, forgetting so what stays on its margins and represents also a part of – often the first step to – the whole. This happens also in studying the Great War. If we talk for example about WWI and Dolomite front – which, in turn, is still today someway a “forgotten front” –, we will probably think at first at the main Alps scenarios of the conflicts, as for example the Sexten Dolomites, neglecting so the near Carnic subgroup, on the north-eastern edge of Italy. As this last entered in the Great War, the mountain ridge from Monte Croce Pass (Passo di Montecroce) to the Monte Croce Carnico Pass (Passo di Monte Croce Carnico) became suddenly a contested battleground between the Austrian Kaiserjäger (supported the first time also by volunteers and inhabitants of the valleys) and the Italian Alpini. A battleground, that remains still today at the margins of the WWI research focus. The new book of Italo Zandonella Callegher (La ragazza del mulo. 1915-1917: il massacro sulla Cresta di Confine, Mursia, 2012) aims to fill in this gap and tell the story of this twofold forgotten front, starting from the assumption that “there are not first and second league victims” and that the people fallen on the western Carnic summits deserve the same attention which is paid to those who fought on the Tofane, Marmolada, Ortigara, Tre Cime or Lagazuoi, to stay at the Dolomite front. The Author, an Italian affirmed alpinist hailing from the Comelico, writer of mountain guides as well as of historical novels, does not deliver to the reader a “simple” reconstruction of the battles and casualties occurred in these places, which covers in any case the first – and longer – section of the book. His work is also a combination of different registers and perspectives, a mixture of different – yet intertwined – narrative lines. So, the accurate description of the WWI events on the Carnic Italian-Austrian border between 1915 and 1917 develops simultaneously to the report on the life of Luigia Concetta, also called Giséta: born in a small village of a valley at the feet of the Popera Mountain, her life was deeply influenced by the Great War and as the Italian Army withdrew to south in 1917, she wandered on the front line looking for food, but found only a mule. Her story delivers a testimony of the sufferance endured by the population in the Dolomite valleys, as the excerpts of diaries and witness reports of soldiers collected in a first appendix of the book also do for those struggling on the front. The Author integrates lastly in the historical and human account a very interesting insight into the geographical setting of this conflict front, offering to the reader in the second appendix a small guide of itineraries that can be undertaken in the region, as part of the in the 70es established trekking high-trail of the “Karnischer Höhenweg”. The book is thus a tribute to the people struggling and falling on the less famous summits of e.g. Monte Rosso (Roteck) and Cavallino (Große Kinigat), to the civil population in the valleys, but also to the mountains. More than in the narrative framework of Giséta’s life, in the style or in the contribution to the history of the alpine war, the charming feature of Zandonella’s book is placed – at least for us – in the strong link between mountains and humans, Carnic Alps and Great War. Yes, because the book enable the reader to walk literally along the front line, to see the summits, the trenches and the valleys, to live visually thus the facts narrated in these pages, as long as the Carnic Alps are not just immobile and inanimate scenery of the WWI, they are living subjects of the story. On the places described in this book we’d like therefore to address in conclusion once again our attention: Carnic Alps are maybe not a first touristic destination, they preserve however – and maybe also on account of this – an uncontaminated environment and, being in 1915 the borderland between the Hapsburg Empire and the Kingdom of Italy, the marks of the front line during WWI. From Passo Montecroce to the Peralba Group, and then Quaterna, Frugnoni, the Roteck summit, Cavallino, Chiadenis and Palombino Mountains: if you walk through all this mountains you can find still today trenches, observation turrets, tunnels, gun emplacements, caves dug into the rock (sometimes now collapsed or still standing). For those who have never been in these places it is quite hard to describe them, and due to the complex geology of the Region, it’s impossible to deliver a synthetic overview of the different peaks of this mountain ridge. Zandonella’s book succeeds in presenting even to the less informed reader a powerful introduction into the neglected history of the WWI in this region and into the geography of this part of the Carnic Alps. It’s therefore a pity that only the Italian public will be able to seize the charm that arises from the strong passion of the author for his mountains and the Great War (no translation into English is in fact for the moment planned). Fortunately the author has not only enriched his book with interesting pictures and maps. He has also kindly made available for WWI Bridges some snapshots he has took of the most important summits of this part of front line. 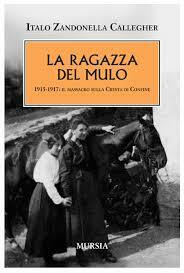 We are glad therefore to offer them besides this short review of La ragazza del mulo (“The girl of the mule”), and the next post will be a photo-reportage by Italo Zandonella Callegher, to whom our thank is due. Stay tuned in the next days!